You are busy this summer planning and reworking lessons -- adding, adjusting, and tweaking. 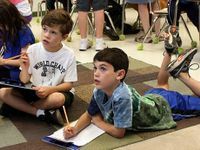 Here's something to think about, fast forward to fall: We know students do plenty of listening in our classes, but what about the other three communication skills they should be engaging in and practicing daily? I'm talking about reading, writing, and speaking. Let's define literacy. It was once known simply as the ability to read and write. Today it's about being able to make sense of and engage in advanced reading, writing, listening, and speaking. Someone who has reached advanced literacy in a new language, for example, is able to engage in these four skills with their new language in any setting -- academically or casually. With content standards looming, it's easy to only focus on the content we teach, and covering material. We have so much to tell students and share with them. However, are we affording students enough time daily to practice crucial communication skills? Here's one way to look at it: Content is what we teach, but there is also the how, and this is where literacy instruction comes in. There are an endless number of engaging, effective strategies to get students to think about, write about, read about, and talk about the content you teach. The ultimate goal of literacy instruction is to build a student's comprehension, writing skills, and overall skills in communication. Students having academic or high-level conversations in small and large group settings does not happen overnight. It takes time -- and scaffolding -- to create a Socratic Seminar setting in your classroom. In order for our students to engage in academic conversation, or accountable talk, they need plenty of practice with informal conversation in pairs and triads. Use the following strategies frequently for building students' oral skills: think-pair-share, elbow partner, shoulder share, and chunk and chew. Kids need to be talking and not sitting passively in their seats. Remember, Vygotsky believed learning to be a very social act! When was the last time your students had sore hands from writing in your class? Just like conversation, writing helps us make sense of what we are learning and helps us make connections to our own lives or others' ideas. You can't avoid thinking when you write. If you haven't heard of the National Writing Project (NWP), it's the largest-scale and longest-standing teacher development program in U.S. history. Workshops are offered nationwide (usually through a local university) where teachers of all content areas learn new and exciting strategies to encourage, support, and grow the young writers in their classrooms. Two tenets of the NWP that I think produce wide gains in student writing: teachers writing side-by-side with students, and creating time on a regular basis in your classroom for writer's workshop that follows a type of writing process that puts the writer in charge (of content, voice, and structure). But, how do we do this? A high-interest classroom library is a great place to start. If you are a Title I school, there should be funds set aside for classroom libraries. If not, advocate for all classrooms at your school site to have a library, even if it's just a handful of books to get you going. You can make the investment yourself, or have a book-raiser party. Email all your friends a wish list for books that students have requested and those easy sells (Twilight, Guinness Book of World Records...). Ask them to bring one or two of the books to your cocktail/appetizer party. (Read this Edutopia post for ideas on how to set up and manage your classroom library).